This short tutorial is about serial output on the C8051F340/380 presenting a simple "Hello World" program. Boards are widely available via different channels. The one used here was bought on ebay. The author used a Debian GNU/Linux system, but the tutorial should work for other Linux distributions, *BSD or other Unices. The C8051F340/380 board is connected to the host computer via a U-EC6 for power and to write the demo onto the board. For serial ouput we attach a serial cable to the RS232 header. 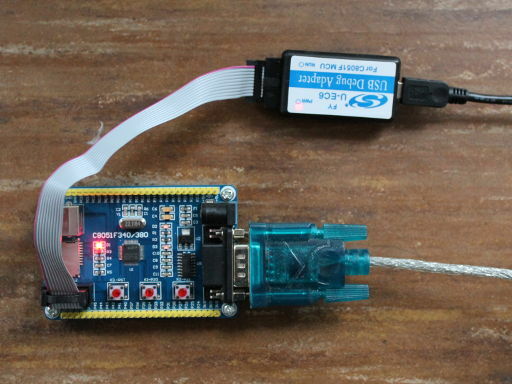 Assuming the board is connected to a U-EC6 attached via USB, ec2writeflash --port USB --hex serial.ihx --run will write the demo onto the board. You can see the "Hello world" by attaching a serial cable to the DB9 connector on the RS232 board, and using a terminal program configured for 4800 baud, no parity, 8 bits, 1 stop bit and no flow control.